How does network functions virtualisation (NFV) relate to SDN? Dan Pitt, Executive Director of the Open Networking Foundation (ONF), discusses how telecom service providers are looking to leverage virtualization technologies in servers as well as in networks in order to improve operational efficiency and create new services. 0:12 - How does NFV relate to SDN? 2:21 - What is the ONF doing to support NFV? 3:16 - What are the key drivers for Service Providers? 4:34 - Does NFV open the door for new, virtualized wholesale telecom services? 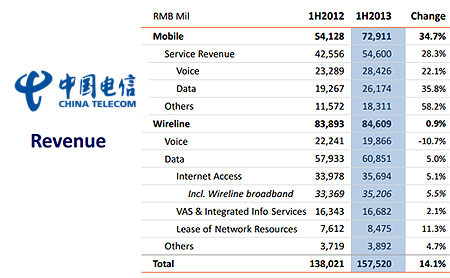 China Telecom posted double-digit growth in both revenues and profits. Operating revenues amounted to RMB157.5 billion, representing an increase of 14.1% over the same period last year. Excluding mobile terminal sales, operating revenues were RMB139.2 billion, representing an increase of 10.0% over the same period last year. EBITDA for the first half of 2013 was RMB50.1 billion, while EBITDA margin was 36.0%. The profit attributable to equity holders of the Company was RMB10.2 billion, representing an increase of 15.9% over the same period last year. Added 13.88 million mobile subscribers, bringing the total to 175 million. 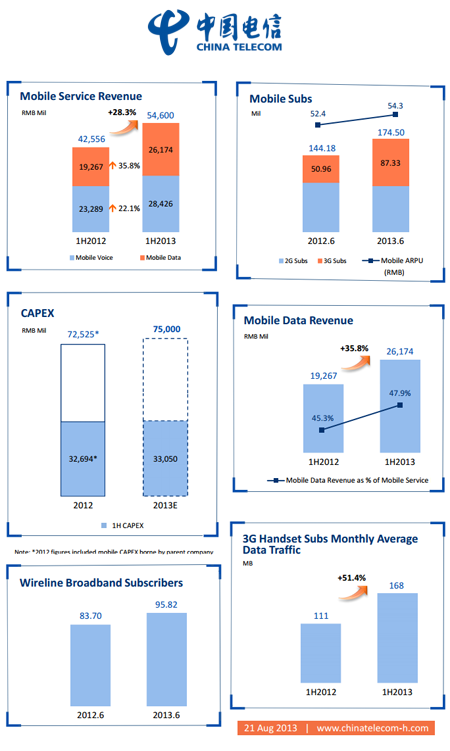 3G subscribers accounted for 50% of total mobile subscribers or 87.33 million. 3G smartphone subscribers accounted for 44% of total mobile subscribers. Aggregate 3G handset data traffic was up 2X over last year. Mobile service revenues amounted to RMB54.6 billion, representing an increase of 28.3% over the same period last year, and accounted for 35% of the total revenues. Revenues from wireline broadband services amounted to RMB35.2 billion, representing an increase of 5.5% over the same period last year. The number of wireline broadband subscribers reached 95.82 million with a net addition of 5.7 million, among which the number of Fibre-to-the-Home (FTTH) subscribers reached 21 million. Local wireline voice usage was down 15.5% compared to last year. Long distance wireline voice usage was down 21% compared to last year. Mobile voice usage (aggregate minutes on the network) was up 20.4% compared to last year. Traditional access lines in service fell 3.4% to 159 million. Public phones in service fell 1% to 12.9 million. ZTE’s revenues for the first half of 2013 decreased 11.9% to RMB 37.58 billion while gross profit reached RMB 310 million, a year-on-year increase of 26.6%. Basic earnings per share amounted to RMB 0.09. The company cited improved gross profit margins and stringent cost controls. 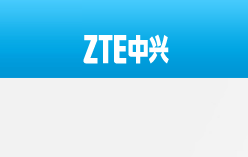 China: ZTE reported operating revenue of RMB 18.821 billion in its domestic market in the first half, accounting for 50.1% of overall operating revenue. Internationally: ZTE reported operating revenue of RMB 18.755 billion from the international market, accounting for 49.9% of overall operating revenue. Product Categories: ZTE reported operating revenue of RMB 19.050 billion for carriers’ networks, RMB 12.461 billion for terminals, and RMB 6.065 billion for telecommunications software systems, services and other products. There was a decline in operating revenue from GSM and UMTS products in the domestic market and GSM handsets and data cards in both the domestic and international markets. ZTE is now forecasting a net profit of between RMB 500 million and RMB 750 million in the first nine months of 2013, rebounding from a loss in the same period a year earlier. 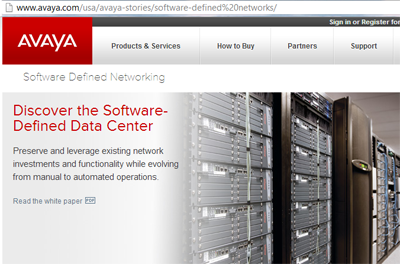 Avaya outlined a Software-Defined Data Center (SDDC) framework based an orchestration process that combines, customizes and commissions compute, storage and network components. Avaya said its framework uses the OpenStack cloud computing platform to enable data center administrations to deploy virtual machines, assign storage and configure networks through a single graphical user interface. The Avaya Fabric Connect further enhances the OpenStack environment by removing restrictions in traditional Ethernet VLAN / Spanning Tree-based networks to enable a more dynamic, flexible and scalable network services model than exists today. 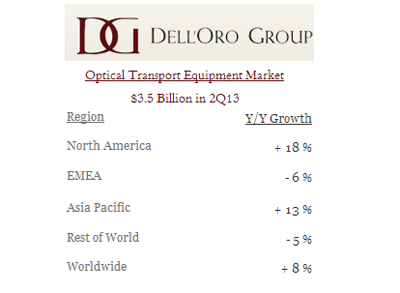 The total optical transport equipment market returned to a positive year-over-year growth rate in the second quarter of 2013 following five consecutive quarters of decline, according to a newly published report by Dell'Oro Group. “It was a great quarter for the optical transport market,” said Jimmy Yu, Vice President of Optical Transport research at Dell’Oro Group. “Demand for optical equipment took a positive turn in the quarter with higher revenues in North America and Asia Pacific pushing the global market revenue upwards by eight percent. We attribute the growth in these two regions as follows. For North America, growth was due to service providers increasing metro capacity to enable better broadband services to residential and enterprise customers, resulting in more DWDM system deployments. The top two vendors benefiting from North America growth were Fujitsu and Ciena. For Asia Pacific, the majority of the growth was due to Chinese service providers expanding their mobile LTE network resulting in a significant roll out of optical packet backhaul systems and DWDM long haul systems for inter-provincial capacity. The top two vendors benefiting from China growth were ZTE and Huawei." Rackspace is launching a Dedicated VMware vCenter Server service that helps enterprise customers to extend their VMware capacity off-premise. The service provides a Rackspace-hosted VMware environment that looks and feels just like an extension of the client's own data center. The Rackspace-hosted VMs are pro-actively supported by VMware Certified Professionals (VCPs) up to the guest-OS layer, and backed by a 100 percent network uptime guarantee and enterprise-grade SLA, along with the company's "Fanatical Support". Rackspace noted that it hosts one of the largest VMware environments and operates the largest OpenStack-based cloud. 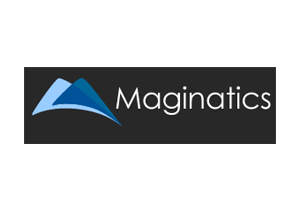 Maginatics, a start-up based in Mountain View, California, raised $17 million in Series B funding for its cloud storage solutions. The company’s flagship product, MagFS (Maginatics FileSystem), "is an elastic, distributed file system that allows organizations to leverage the agility and economics of object storage (‘the cloud’) without disrupting existing workflows for both traditional and mobile users." MagFS provides a global namespace for the management of file services, along with accelerations tools. Ventures and existing investors including Atlantic Bridge and VMware. 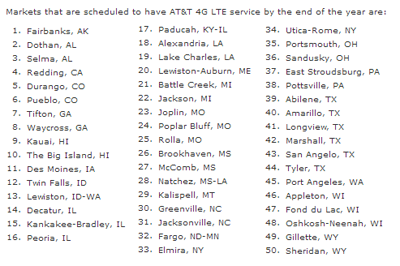 AT&T announced plans to roll out 4G LTE in at least 50 additional markets by the end of this year. AT&T 4G LTE currently covers more than 225 million people and 370 markets, and by the end of 2013, coverage is expected to expand to nearly 270 million people and more than 400 markets. The company noted that it has invested nearly $98 billion into operations over the past 3 years.